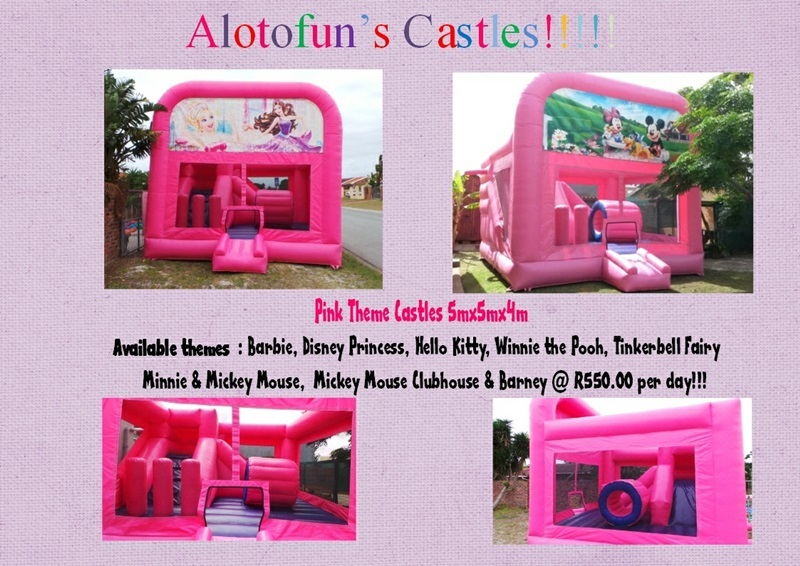 Jumping Castles for hire:- Alotofun Castles & PartyZ has a range of theme jumping castles available to hire, which were specially designed with the thought of SAFETY FIRST!!!! Why use our castles???? 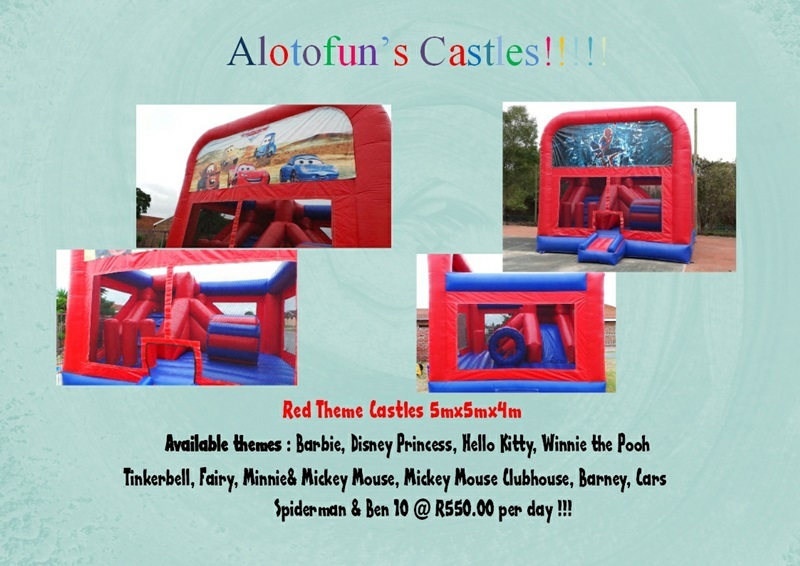 *Our theme castles are fully enclosed, all the activities are inside the castle to keep the children entertained without the worry of the kids falling off the castle and get injured. *Moms and dads are still able to keep an eye on the children from the outside while they are enjoying themselves jumping & sliding. 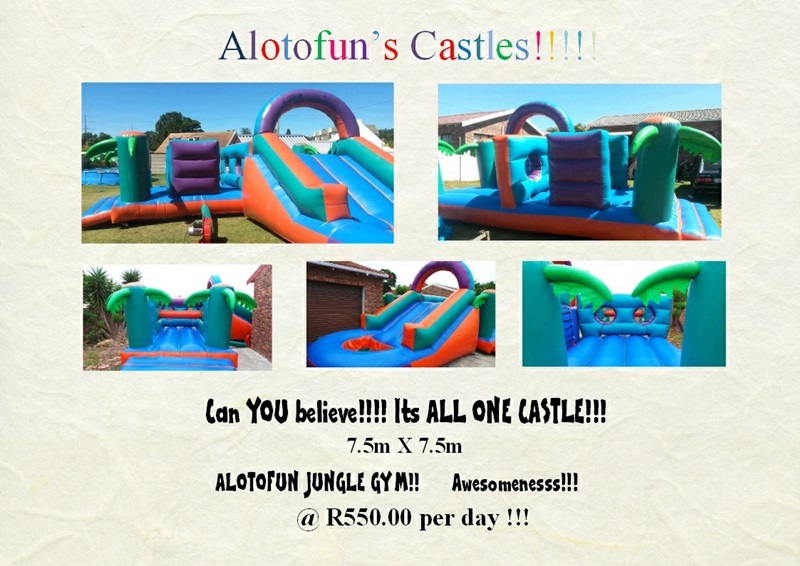 *Loads of activities on one castle: JUMP, CLIMB, SLIDE, PUNCHING ON THE PUNCHING BAGS & CLIMBING THROUGH THE TUNNEL! There are even a basketball hoop on the outside of the castle. This is like having a Mickey Clubhouse in one castle!!! *Lots of themes to choose from: For the girls we have: Disney Princess, Hello Kitty, Barbie & Tinkerbell. For the boys we have: Disney cars, Spiderman & Ben 10. Then we also have the famous Barney, Winnie The Pooh and Minnie & Mickey. We also offer party packages which includes all your party needs in one affordable package, including delivery, set up and collection. Please feel free to contact us for a full price list. 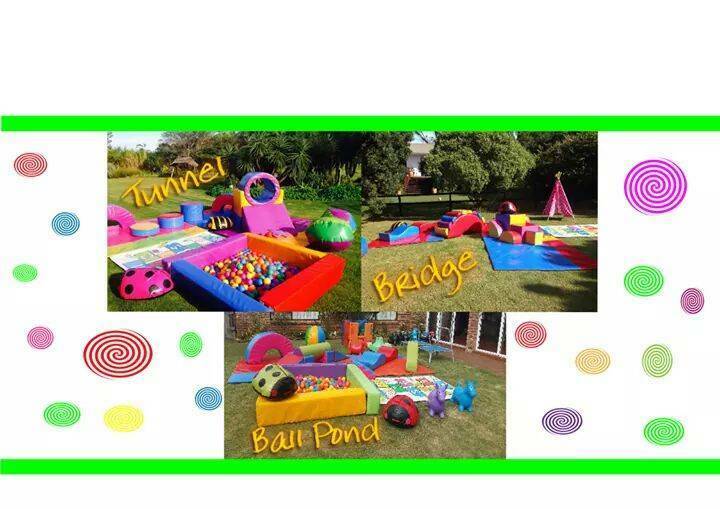 We are looking forward to assist you in creating a memorable party for your little one. Contact Elna or Tanya. Alotofun Castles and Kiddies Partz has been selected as one of our Most Popular Party and Event Services! At PartiesAndCelebrations our mission is to connect you with party and event planners and suppliers and make it quick and easy to find, compare and select the best party products and services based on your search criteria. We are building the most comprehensive online marketplace for party and event products and services in South Africa where all types of experts for weddings, birthdays, events and celebrations can be found and contacted quickly and easily.